LOS ANGELES, California – The timing of Oscar De La Hoya’s admission that he saw his defeat to Manny Pacquiao coming when they fought last December 6, 2008 in Las Vegas, Nevada, could be a ploy to boost Miguel Angel Cotto’s morale and erase the stigma in Cotto’s heart.De La Hoya (39-6, 30 KO’s), who retired at age 36 after absorbing a gut-wrenching 8th round technical knockout (TKO) loss to Pacquiao, recently told BoxingScene.com he already had the “bad feeling” that he would not win against the then 29-year-old Pacquiao while in his training camp in Big Bear, California. A mouse that formed in De La Hoya’s eyes during the Big Bear training was reportedly inflicted by unbeaten featherweight Edwin Valero who was dismissed from the camp supposedly for violations of “code of silence” when he revealed to reporters he tortured the American golden boy but got no credit for the headline news. Some ring analysts, however, believed De La Hoya made the statement to make it clear that Pacquiao was beating up a washed up fighter who could hardly pull the arrow as a matter of “mind conditioning” for the 28-year-old Cotto, who will stake his World Boxing Organization (WBO) welterweight crown against the now 30-year-old Pacquiao on November 14 at the MGM Grand in Las Vegas, Nevada. Analysts said De La Hoya, who is rooting for the shaven-skull Puerto Rican dynamo, could be sending a curt message to Team Cotto not to be bothered by Pacquiao’s reputation as “giant killer” even if the hard-hitting Filipino lefty has deposited to the canvas in two rounds the dynamite-fisted Ricky “The Hitman” Hatton last May 2 to bag the International Boxing Organization (IBO) light welterweight championship. De La Hoya, who owns Top Rank Promotion’s chief rival, the Golden Boy Promotions, considers Cotto as a lucrative customer and is priming him up for a possible rematch with WBA 147 lbs king Shane Mosley or the most sought-after client, Floyd Mayweather Jr.
A loss to Pacquiao for Cotto would bring De La Hoya and his ilk back to the drawing board to plot another mind-boggling assassination attempt. A Pacquiao victory would mean Top Rank’s safe stay in the totem pole of money game and the right to stage Pacquiao’s richest battle either against Mosley or Mayweather Jr. who is asking a hefty sum to face the Filipino superstar. After the magnificent conquest of the six-time world champion and 1992 Barcelona Olympics gold medalist De La Hoya, Pacquiao was formally installed as best boxer pound-for-pound thus reportedly sending instant worries and fears to warriors in the welterweight and light middleweight classes who didn’t expect Pacquiao’s sudden invasion. When De La Hoya as the godfather of heavier bombers fell, they tapped Hatton to next man the guillotine and stop Pacquiao’s meteoric rise. De La Hoya was so sure of a Hatton win that he made more pre-fight swanks than the sedate Hatton. Alas, it was Hatton who was chopped to pieces in brutal manner that prompted De La Hoya to boycott the post fight press conference to share grief with the crestfallen Briton in the emergency room. 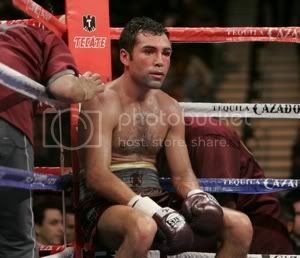 De La Hoya’s total humiliation became the talk of the town. The responsibility to halt Pacquiao on his tracks now rests on the fists of Cotto, the terror of Caguas, who will go to war versus Pacquiao armed with a record of 34 win, 27 knockouts and one loss as against Pacquiao’s 49 wins, 37 knockouts, three losses and two draws. Much is expected of Cotto from De La Hoya himself. Observers said he might next advice Cotto to bring a revolver when he climbs the ring on November 14 to ensure Pacquiao’s elimination.